How controversial is this book? This book is so controversial that prestigious universities around the world have refused to consider including it in their undergraduate and graduate business curriculums. Where can I buy a copy of this book? You can't buy a copy of this book -- yet. Once it is officially published, however, either through a giant, well-funded and handsomely author-compensating publishing house or through our own FSRI press, we will be sure to let you know when it is available. Can I really become a VP in six weeks? 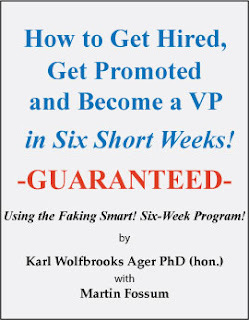 If you buy this book and follow the instructions provided, yes, you will become a VP. It says "guaranteed" on the cover, doesn't it? Is this book a video game or an MP3 file? No, this book is a book that you open and read. When you are done reading it you close it and stick it back on a bookshelf next to other books. Should I buy this book if I'm already a VP? Even if you are currently a VP, you should still buy this book. Before reading it, however, we encourage you to quit your current job to insure that you begin the Faking Smart! Six-Week Program with a fresh perspective. 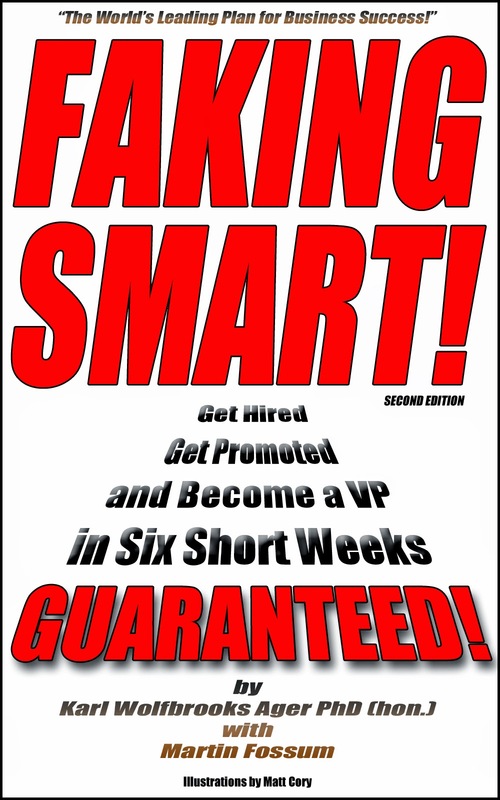 Once you've completed the six-week program you will, again, be a VP, only this time you'll have achieved your position by Faking Smart!